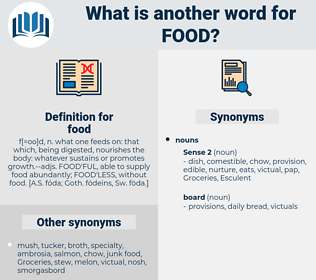 What is another word for food? foodstuff, foodstuffs, nutrition, dietary, diet. nourishment, foodstuff, food-processing, fodder, dietary, seafood, diet, fast-food. individuals, methods, methodologies, fuels, farmers, components, Children, settlements, outputs, approaches, therapies, Mains, Ships, tags, Les, Its, feeding, nutritional. 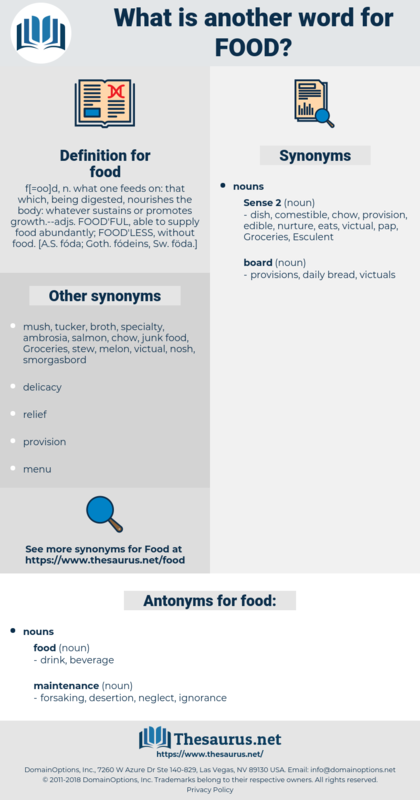 Addenda, foraging, Les, gastronomy, feedingstuff, forage, fuelling, gastronomic. rations, aliments, eating, feed, feeds. nutrition, eating, feeding, gourmet, feed, feeds, snack, ration. It was pretty good food, and there was enough of it for two; but the women would not say a word in answer to my questions.
" I do not think so, Alurna," the first girl said, without taking her eyes from her food. alimentation, fare, medium, beverage, micronutrient, feed, water, vitellus, provender, food product, nutriment, comestible, yolk, comfort food, aliment, manna from heaven, viands, culture medium, victuals, pabulum, sustenance, provisions, commissariat, edible, victual, chyme, soul food, nutrition, manna, eatable, miraculous food, drink, nourishment, potable, drinkable, foodstuff.